With their roots in the earth and their stems twining upward, vines are a great solution where ground space is limited but vertical space is available. Choose a native species beloved by hummingbirds, butterflies, bumble bees or birds and you will create food and habitat where once there was none. Imagine the barren wire of a chain link fence hidden by a wall of leaves and covered with blossoms in the spring and fruits in the fall. 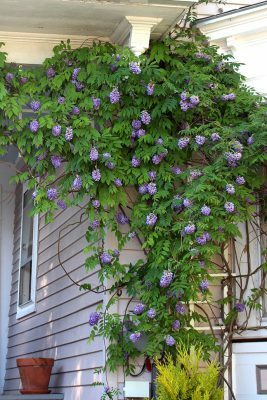 Admire the climbing stems of a vine weaving in and out of a trellis, trained up latticework over a doorway or enlivening a plain wall. Relax under an arbor shaded by a canopy of leaves with fruits dangling down, or be enchanted as you pass through an arched gateway covered with vines. Vines can also add much needed vegetation to an impoverished urban environment where there is very little planting space. Instead of hot sun reflecting heat off the bare side of a concrete or metal building, a wall of leaves would absorb solar energy and carbon dioxide, give off oxygen to cool and moisten the air, and provide habitat for birds, pollinating insects and other fauna. Even where there is no soil to plant, a large pot with a vine spilling down its side or weaving up around a porch railing can add a touch of life in an otherwise barren area. There are half a dozen vines native to Maine that that could green these vertical spaces. Additionally, there are many more species from southern New England to the mid-South that are hardy enough to be grown in Maine gardens. Below are a dozen vines, the first are true Maine natives, the second half from further south. An herbaceous biennial of moist deciduous forests native throughout much of eastern North America. 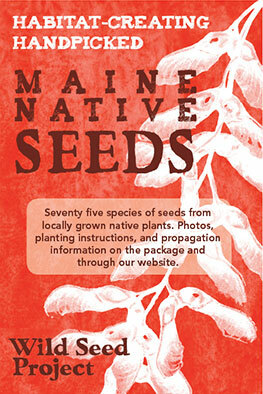 This is a rare plant in all of its native range, including Maine. Specialty nurseries have propagated this plant from seed for years, and it is a garden-worthy species if you can find nursery propagated plants or seed*. 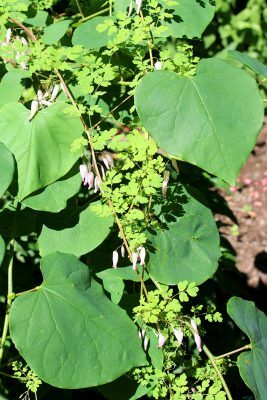 Related to bleeding heart, this delicate herbaceous vine spends its first year as a small ground-dwelling herb in moist shady soil. In the second year, thin bright green stems clamber up an open fence or large shrub and are covered with small pale pink flowers. Sited in partial shade with fertile moist soil, it will re-seed and come back year after year. *NOTE: Ranked as a rare and protected species in Maine, it is illegal to collect seeds or plants of Adlumia fungosa in the wild. An herbaceous twining vine of moist wooded edges and streamside habitats. Green compound leaves on thin stems twist beautifully on a lattice or wire fence. 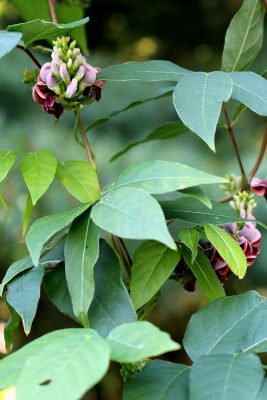 In mid-summer globe shaped dusky pink to brownish flowers peak out from the leaves and mature into small peapods in the fall. Ground-nut is in the legume family and its root is a delicious edible tuber that was a reliable food for the Native Americans and remains a favorite of foragers today. This plant should be in every schoolyard enlivening a barren fence and teaching children about delicious native foods. It will grow in sun to shade in moderately moist soil. This is an herbaceous vine of roadside ditches and wet meadows. The long thin stems climb up open shrubs and bloom in August with small white cross-shaped flowers attractive to pollinators. Later in the year the long silky seed heads glimmer and remain visible for many months. This is a great plant for a split rail or trellis fence, or to climb up a large open shrub. 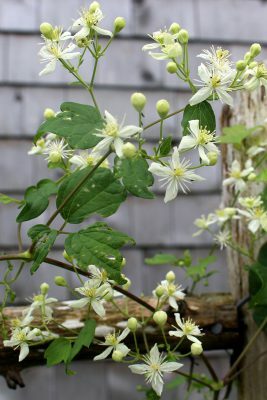 Like all clematis its roots want shade and moist fertile soil, while the blossoms are most abundant up in the sun. 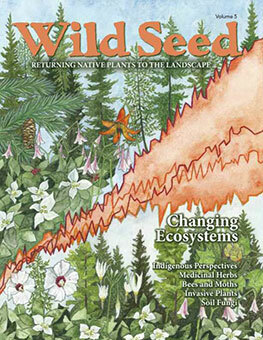 Wild Seed Project is featuring this in our Seed Sale. A fast-growing and dramatic annual vine of woodland edges and roadsides, this relative of squash and cucumber has large star-shaped bright green leaves and numerous clusters of creamy white flowers that attract many pollinating insects from midsummer to fall. The spiky cucumber-like fruits are enchanting. Ideal for fences, trellises, a teepee, or roaming over large open shrubs in sun to part shade. Children love this plant. These are two very similar species from woodland edge habitats. The former has twining stems that scramble across the ground or up trees and grasp with delicate tendrils, the latter adhere to walls with little suction cups, perfect for mail boxes and phone poles, or masonry walls. The Virginia Creeper Sphinx Moth needs the foliage of this important wildlife plant in its caterpillar stage, and birds prize the fall fruits as the leaves turn burgundy in fall. This is an effective and beautiful plant for large spaces. Imagine large concrete walls and highway overpasses green with this plant. Virginia creeper can be grown in a large pot; the foliage looks great spilling over the sides. 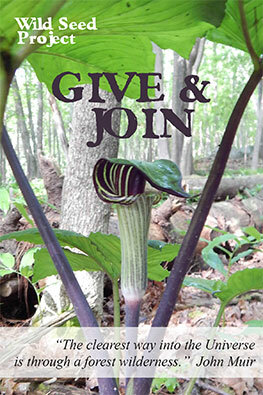 (See the article on this plant by Cathy Reese in Wild Seed Volume 1). With large lobed leaves and woody stems, our native grapevines climb up and over large shrubs and trees in river and lakeside environments. The American grapes are rampant growers with stems reaching 40 feet in length. Give them a large fence or arbor to accommodate their spread. 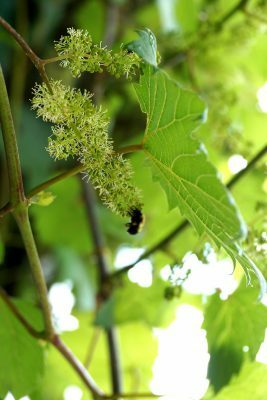 If you have a big space to cover, you will have a beautiful and edible vine that supports pollinators, birds and people, and casts excellent shade. I would love to see this plant trained up tall houses or apartment building as commonly seen in Mediterranean countries. This vine leafs out very early in the spring and begins a long season of bloom in late May. 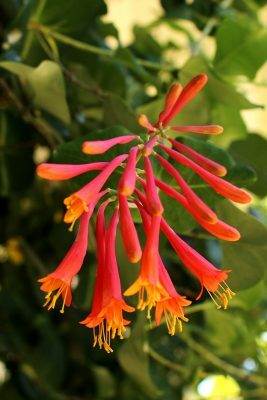 The coral tubular, whorled flower clusters attract hummingbirds and other insect pollinators. In the fall, birds relish orange-red fruits. A twining vine, it can be trained up wire or lattice around a porch or doorway, or left to scramble over a fence or down a bank. It also makes a great potted plant. It is tolerant of sun to shade (the more sun, the more blossoms) in moderately moist and fertile soil. This is a perennial vine with beautiful pleated leaves on twining stems about 10 feet long. In the spring the foliage has a coppery sheen that turns a deep green by summer. 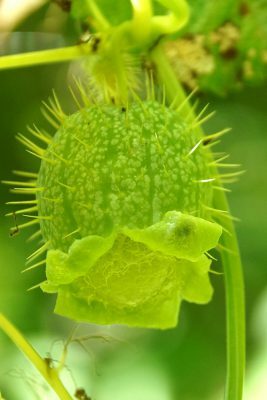 Small green flowers ripen to unusual, tan seedpods. The root of this plant is used medicinally. Wild Yam is a great choice twining up a lamppost, downspout, lattice fence or large open shrub. Plant in part to full shade and moderately moist, fertile soil. This species of wisteria is native to the Southeastern US and is less rampant than the commonly planted Asian species. After the leaves appear in spring, lavender pea-like flower clusters dangle like grapes along the stems. Native to woodland edges and thickets, its woody stems climb by twining and need a strong supportive arbor or metal trellis to accommodate the stems that can reach 25 feet. A large vine for grand spaces, it is much easier to manage than its exotic cousin. This is a very large climbing vine of thickets and disturbed areas in the Southeastern US. The dramatic trumpet shaped flowers are a hummingbird favorite. A mature plant will be covered with thousands of flowers, and these will attract an abundance of hummingbirds during bloom. Other birds will make nests amongst its branches and grace you with their song. 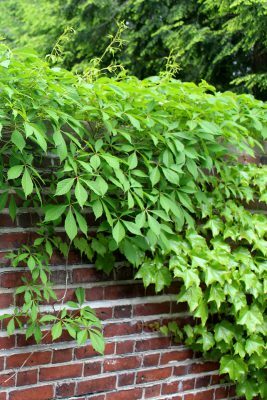 This clinging vine attaches itself by aerial roots and needs a large fence, arbor, masonry wall or building to climb to its full potential. It is not a plant for small spaces since it is an aggressive spreader. This plant is well suited to tough landscapes, such as an industrial park or shopping mall, where something large and low maintenance could create a dynamic, green space and provide a lot of wildlife habitat. It thrives in sun to part shade, with dryer soils limiting its growth. A large vine of rich woods and stream banks, this plant has been planted on New England porches since Victorian times. 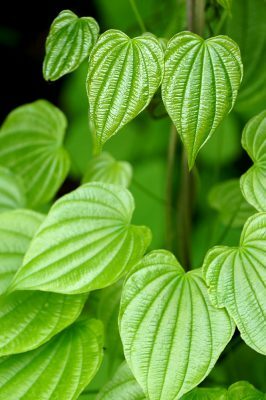 The large, heart-shaped leaves create a dense and tropical looking screen. The tubular flowers are hidden among the leaves and are interesting but inconspicuous. This vine is the sole food for the blue pipe-vine swallowtail butterfly. This plant needs a trellis or wires to support its twining woody stems. A large teepee with this plant can make a wonderful children’s play space.